Whether it’s a refreshing pick-me-up in the morning or a clarifying cleanse after working out, sometimes you just can’t beat a good shower. Stepping under the spray of a shower can work wonders in terms of clearing your mind and stimulating your senses. 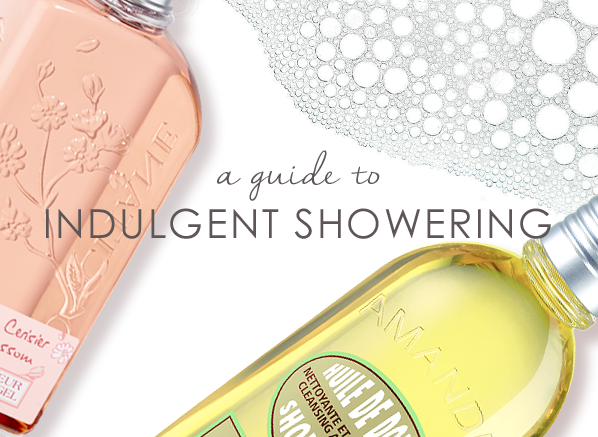 While relaxing is the name of the game in the bath, showering is all about pepping up your spirits and your skin. Exfoliating your body will make an unbelievable difference in improving its overall texture, tone and colour, as the rigorous motion stimulates the blood blow and gets rid of dead skin cells. As long as the formulation is not too abrasive, it is often even more beneficial to use scrubs on dry skin rather than wet to really work the product in. Shower gel is perhaps the most popular cleansing product in the shower thanks to Its versatility and ease of use, along with its plethora of different scents and colours. A little always goes a long way in providing a deep down clean that just can’t be beat. There’s something about surrounding yourself with fragrant bubbles that is instantly uplifting, especially if they’re fragranced with a scent that you love. Try washing with a scented shower gel, coordinating the scent with a matching body lotion and intensifying the experience with a few spritzes of the complementary perfume. Bliss! Better suited for drier skin, shower creams provide an extra dose of hydration with their intensively creamy formulations. Rich yet lightweight, shower creams are a fabulous choice if you’re looking to give yourself a gentle clean, whilst maintaining and enhancing softness and smoothness in your skin. Oils makes for a gentle cleanser for skin that does not get on with the soap bases of gels and creams. Shower Oils are excellent for very dry skin as they impart intensive hydration whilst cleansing the skin to achieve a comfortable moisture balance. Shower oils are luxe products and tend to be slightly more expensive due to the luxurious ingredients used, but the fragrance is richer and the benefits are plentiful. Foams and mousses are often enriched with essential oils that gently cleanse the body whilst softening and smoothing the skin. A more innovative way to cleanse your body, mousse formulations start off as liquid inside the bottle, before expanding into a mousse upon contact with the skin – a little goes a very long way! There is nothing quite like smoothing on some luxe body cream to seal in the moisture. Densely formulated and more fragrant than a body lotion, the cream will deliver long-lasting hydration and despite its thickness is not at all greasy. For skin that loves to feel silky, nurtured and cared for. Less creamy than a body cream though still very nourishing, body lotions beautifully condition the skin whilst imparting a degree of scent that is warmed by body heat. The most popular form of body moisturising due to its lightness, versatility and non-oiliness. A lighter emulsion for weightless moisturising with a hint of scent, body veils are an excellent choice for the warmer months. A very silky lotion that lightly hydrates and softens, giving you a beautiful second skin. This entry was posted on Sunday, January 9th, 2011 at 5:49 pm and is filed under Bath & Shower, Bath & Shower, Shopping Guides. You can follow any responses to this entry through the RSS 2.0 feed. You can skip to the end and leave a response. Pinging is currently not allowed.